Rambling Through Parenthood : Check Your Tyres, Whatever the Weather! Check Your Tyres, Whatever the Weather! I don’t often get the chance to drive in freezing, sub-zero conditions. And then there are days like this week when compacted snow and ice on untreated roads make for treacherous driving. I was turning right at the end of our lane when I felt my car tyres struggling to grip on a large patch of ice. Fortunately, my tyres are in good nick and held fast as I manoeuvred the car across the road. As I heaved a sigh of relief, it got me thinking about car safety and tyre health. Things like engine oil level and battery life have indicators that alert us to imminent trouble. It’s not the same with tyres. Tyres don’t have any way of indicating their condition. The only way to make sure our treads are in good health is to check them over. 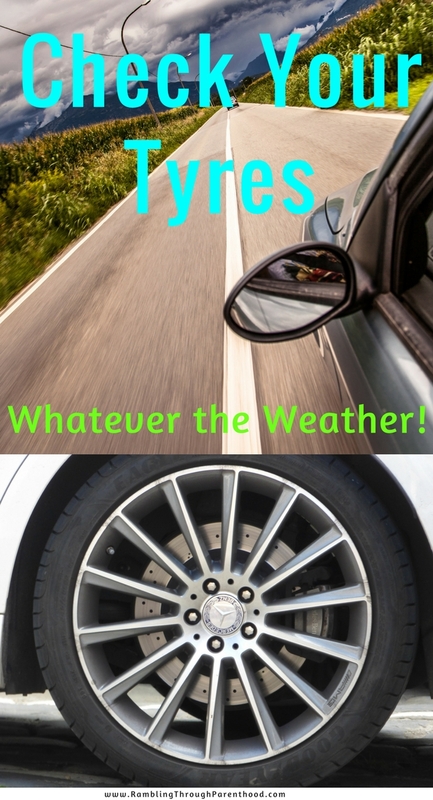 tyreplus.co.uk have launched a #TestYourTreads campaign to raise awareness about tyre safety. Whether you are setting off on a road trip or commuting in inclement weather, here are a few simple checks to ensure your car tyres function at an optimum level. This handy little test requires you to pop a 20p coin in the grooves of the tyre. If the outer band of the coin is visible at any point, the treads are below the legal limit of 1.6mm. Give the tyres a look over every once in a while to check for any obvious cuts, bulges and cracks. Consider replacing your tyres if they fail the 20p test or you see obvious signs of wear and tear. Make sure your car tyres are inflated to the correct recommended pressure. This can be found in the manufacturer’s manual or stuck inside the driver-side door of the car. Under-inflated tyres affect car handling and grip. They tend to wear out more quickly and are also more likely to burst, especially on high-speed motorway journeys. Optimally inflated tyres are more fuel efficient and help reduce running costs. Do you carry out regular tyre checks on your car? What would you add to this check-list?